The Urhobo Elders and Leaders of the All Progressive Congress (APC) yesterday stormed the residence of the Delta State APC Leader, Olorogun O'tega Emerhor in thier large numbers begging him to contest the Delta Central Senatorial Position in the Forthcoming general election, just as they presented the senate form to him. 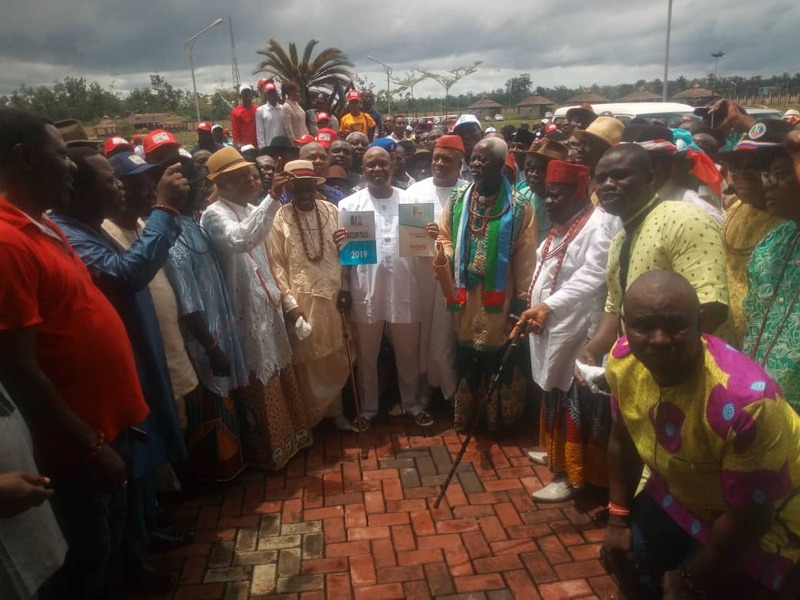 The Urhobo Elders led by Chief Sylvester Kowho while appealing to Emerhor on behalf other elders and leaders, said there is vacuum in the Delta Central Senatorial Seat, adding that; "The person we have there in the senate is a rascal and disgrace to urhobo nation; and we are saying that we want a change in the urhobo senate position. And we want our Delta State APC Leader, Olorogun O'tega Emerhor to takeover the Delta Central Senatorial Position. We want him to go there to make a change for the urhobo nation. We beg u Olorogun to accept our plea and we have taken the pain to buy you the senate form and we hereby present it to you. Please accept it." In response, Olorogun O'tega Emerhor who was so surprised over the decision of the Urhobo APC Elders to purchase a senate form for him, thanked the elders for the gesture, saying, "I have heard you. I am from Delta Central and I'm the leader of APC in Delta State. Delta Central is the heart beat of APC as you know; the represention Delta Central must represent, must be to the interest of urhobo and Delta State. We have the current represention; but as the elders said, the present senator is not representing urhobo nation well and he is not reflecting the culture of the Urhobo in Abuja". He added; "What we hear is rascality, thuggery. We don't hear diplomacy, we don't hear nagotiation. He is even creating problems for President Muhammadu Buhari he claims he is supporting. But we will go there to represent urhobo to solve problems and work with Mr. President; and do things in a way that he (Buhari) can implement his agenda; that is what we will do. "But when they have come to ask me to run, you know it is a serious matter; they bought the form worth N7Million by themselves and presented to me. "I have heard them and I am going to consult my immediate family and my political advisers because the form has a deadline and it is a call to duty to come and give better represention to the people of Delta Central in Abuja", he noted.